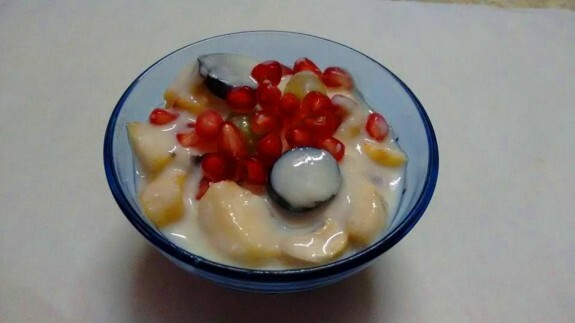 To make this Fruits custard, you can use any type of fruits that you have. Having chilled fruit custard during summer is really cooling and refreshing for anyone. Here I have make this fruit custard without custard powder as I found so many people does not like custard powder or its taste. So, it would definitely like by them. 1. Chopped all the fruits and keep it in a plate. Cut the coconut into small slices and keep it on the same plate. Keep the plate on the refrigerator. 2. Now, take a deep bottom sauce pan and pour the milk. Now, keep this in a low flame gas. Add sugar and saffron (optional). Stir it continuously until sugar dissolves. 3. Now, mix all the dry fruits and boil it for 3 mins. 4. In a bowl take 2 Tbsp milk and mix the corn flour. Mix it properly so that any lumps will not there. 5. Now, add this mixture into the boiling milk. Keep stirring the milk for 3-5 mins. Once the milks tart thickening, switch of the gas. 6. Allow this milk to cool down in normal temperature. Now, add the fruits in this milk and keep the mixture in the refrigerator for 2-3 hours. 7. Serve this chill. You can also add ice cream on top.